Amazon.com has promised to make a paid app free every day in the Amazon Appstore, and today's app is Aces Traffic Puzzle Pack. Honk! Honk! You're trapped! 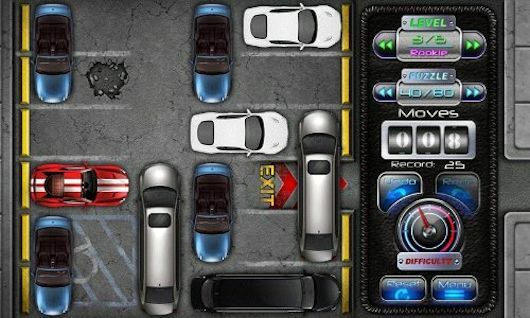 You're stuck in a crowded parking lot, so you must use masterful strategy to maneuver the cars and clear a path for your grand escape. With 480 different puzzles, Aces Traffic Pack is a challenge for even the most sophisticated drivers. This puzzler offers 80 puzzles per level from Novice, Amateur, Rookie, Pro, All Star, and finally Ace. You'll always have to come up with a new escape plan. The bird's-eye view of each parking disaster provides a clear field of vision and perspective. For further ease of use, apply the gridlines to help visualize your next move. You can't be a road king if you don't keep track of your stats. Aces Traffic Pack keeps a variety of records. Keep tabs on your overall stats, level stats, and even stats for specific puzzles. The online high scores and statistic tracking adds a competitive element, so you can compete against yourself or challenge a friend to beat your best time or lowest move count. See which puzzles you've easily escaped, which are giving you traffic nightmares, and which ones you've haven't solved yet. Aces Traffic Pack features colorful backdrops of cityscapes with open starry skies and the rumbling of car engines. The racecar-themed interface is intuitive and easy to navigate, but there's nothing easy about figuring out your escape route.